3 1/4X6 1/2 inches, the sheet size is: 9 1/2X12 1/2 inches. This image appears as number 187 of the Morse catalog. 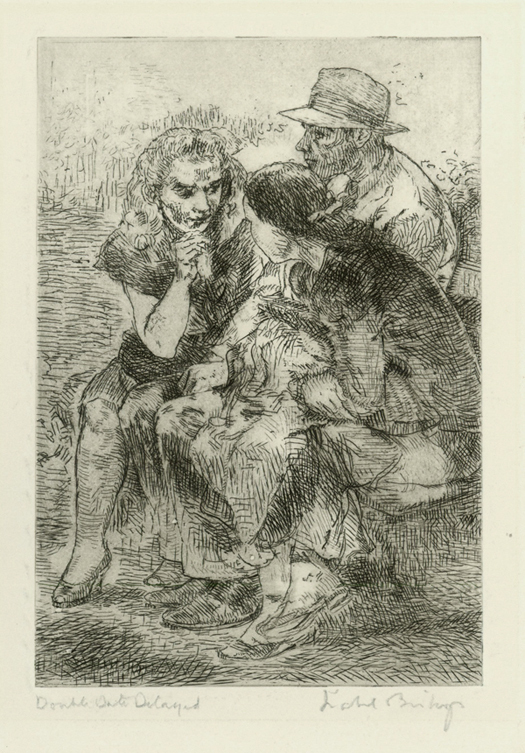 Original 1948 etching by the American artist, Isabel Bishop, measuring 5 x 3 1/2 inches, printed by the artist in the original edition of 22, not the restrike done in 1978, cat: Teller-43. 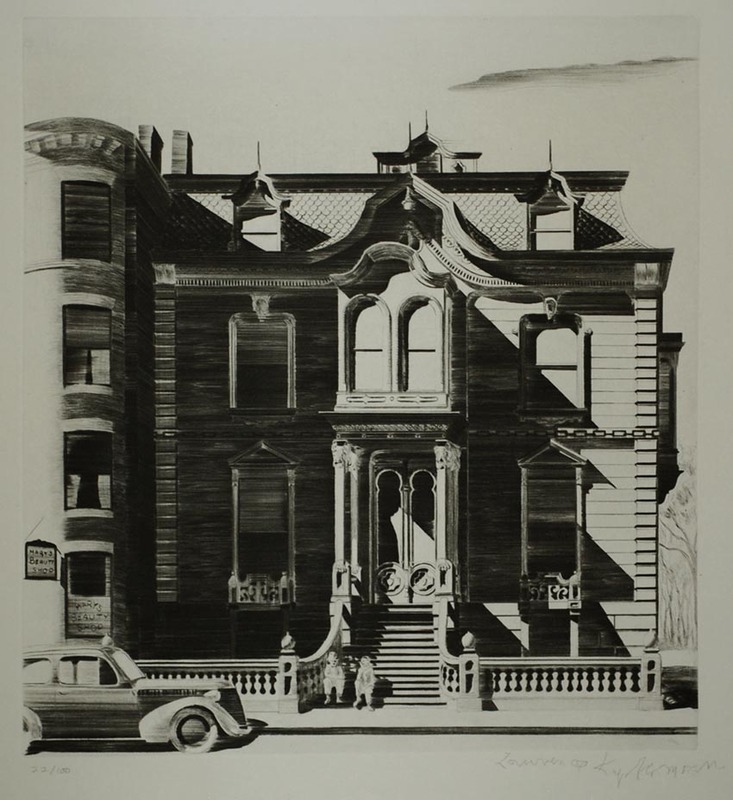 Bishop was one of the foremost women artists of the twentieth century, best known for her images of life around Union Square in New York City where her studio was located. Her sense of observation along with her great technical skill enabled her to portrayed mood and movement in her simple images of ordinary people. 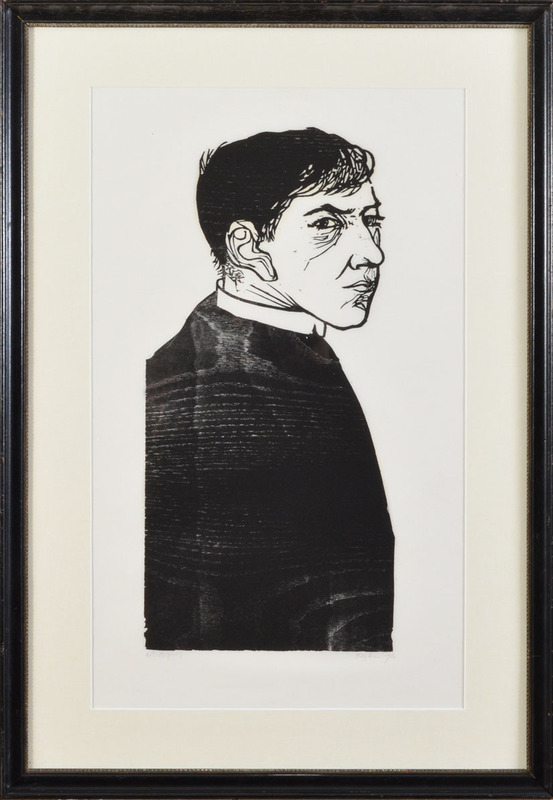 A rare artist's proof by Leonard Baskin, this is an early woodcut portraying the artist dressed as a priest. The image size is 21 1/4 x 10 inches, published in 1952, cat: Fern & O'Sullivan-193, pencil signed and dated, notated 'artist's proof', framed. Baskin was an important artist in the mid 20th century, known for his evocative wood engravings, lithographs, and etchings. In the era of abstract expressionism, Baskin’s work tended toward the representational with a strong classical influence, and over the course of his long career he created many self portraits which beautifully showcase the evolution of his style. 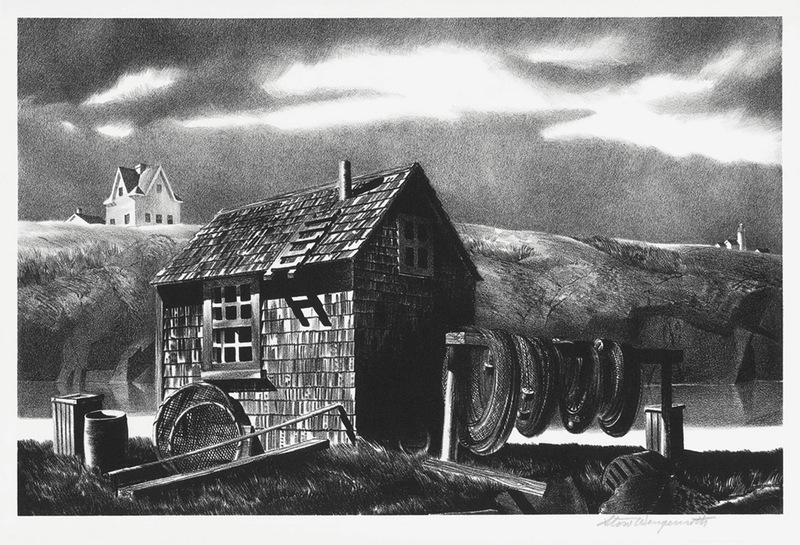 An atmospheric scene of Rockport, Massachusetts, this is one of Wengenroth's early lithographs, published in 1935 in a small edition of 50 impressions. The image size is 7 7/8 x 12 1/4 inches, cat: Stuckey-51, pencil signed. Stow Wengenroth was one of the preeminent lithographers of 20th century America, known for his atmospheric, incredibly detailed images of the New England landscape and coastline. He studied at the Art Students League and the Grand Central School of Art in New York, and in the summers studied with John Carlson in Woodstock NY and George Ennis in Eastport ME. In 1931 he had his first one man show at the MacBeth Galleries, beginning a long and very successful artistic career. 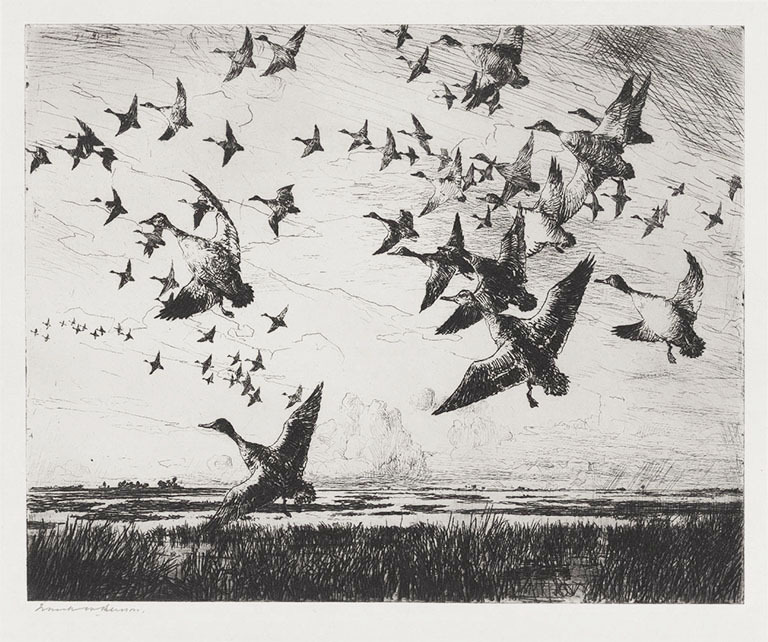 This expressive drypoint etching of ducks taking flight by Frank Benson was published in 1918 in an edition of 150. It is pencil signed on the lower margin. This image measures 7 7/8 x 9 7/8 inches with wide margins on a sheet size of 12 1/2 x 15 3/8 inches. Benson was a very successful painter and a member of "The Ten" along with Childe Hassam and J. Alden Weir, before he began his sporting paintings and etchings for which he is most widely known. 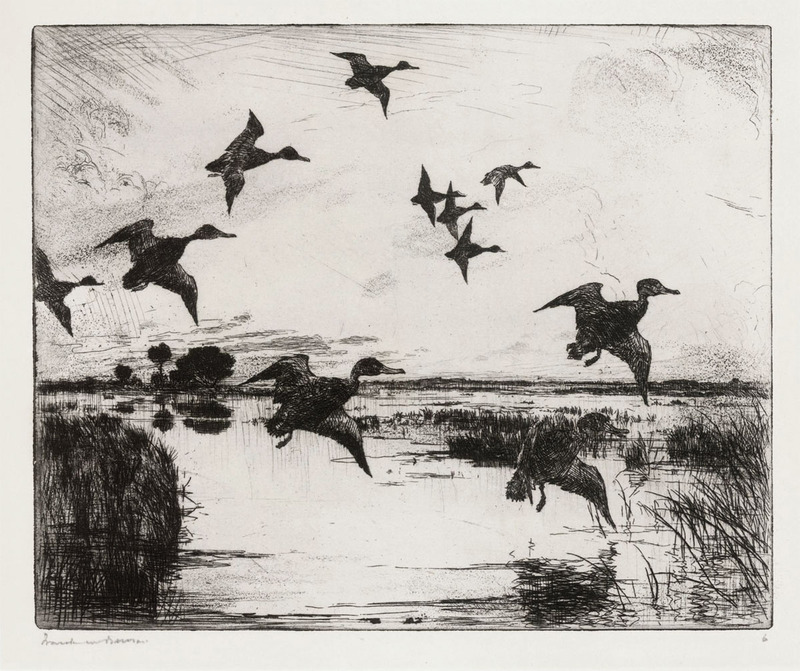 In 1912, at the age of 50, Benson began his etchings and drypoints, mainly of wild fowl which he depicted with expressive lines and rich toning that exquisitely captured the life and energy of the wild birds. 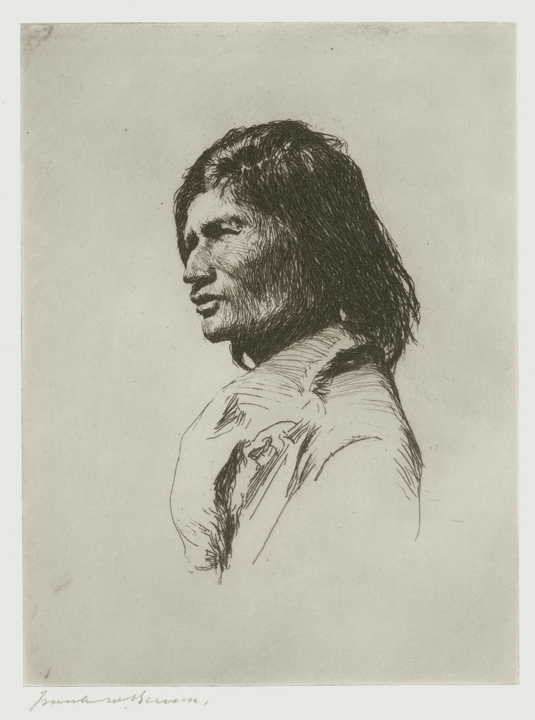 His etchings were in high demand from the very start, and have remained favorites for collectors ever since. He was a founding member of the Boston Guild of Artists and a long time teacher at the Museum School in Boston. This is an original color aquatint etching by American artist John Taylor Arms (1887-1953). 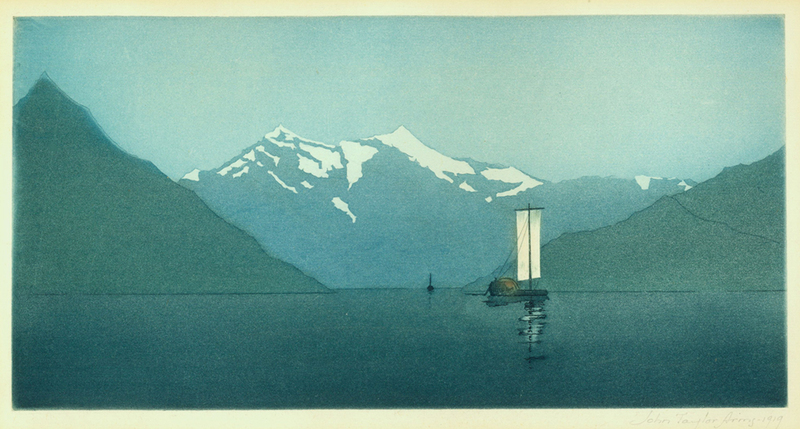 The title of this work is "On Lake Como"...It was created and printed in 1919 in a small edition of only 63 signed proofs. The image measures 4 7/8X9 3/4 inches printed on a medium weight laid type paper, good condition a few minor handling creases in the border. This image appears in the Fletcher catalog as image number 22. One of the first of his experimental color etchings, the etching is hand signed and dated in pencil by the artist. 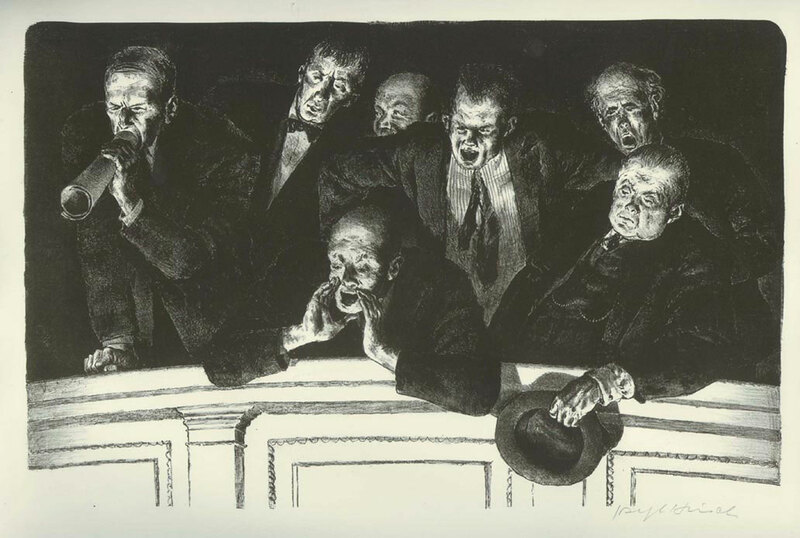 This is a very rich impression of a great sporting etching by Frank Benson. 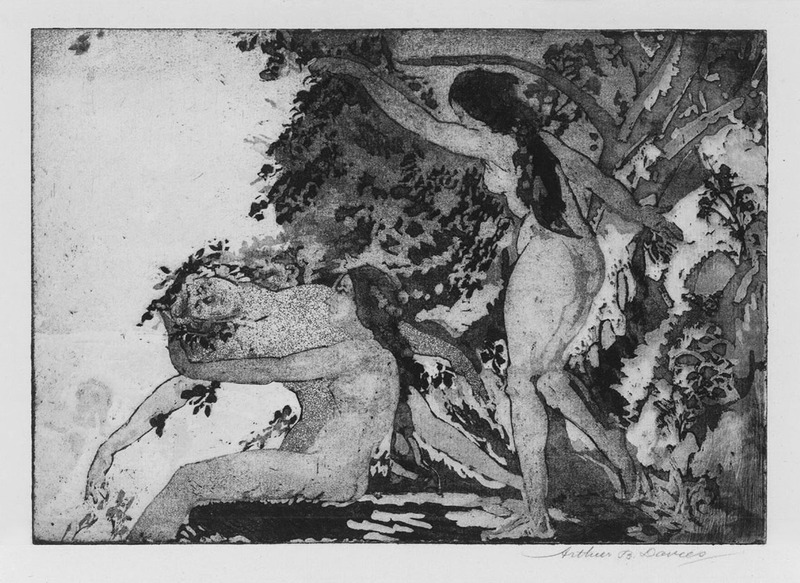 The image size is 9 x 11 inches, published in 1918 in an edition of 150, cat: Ordeman-131, pencil signed and numbered "6". 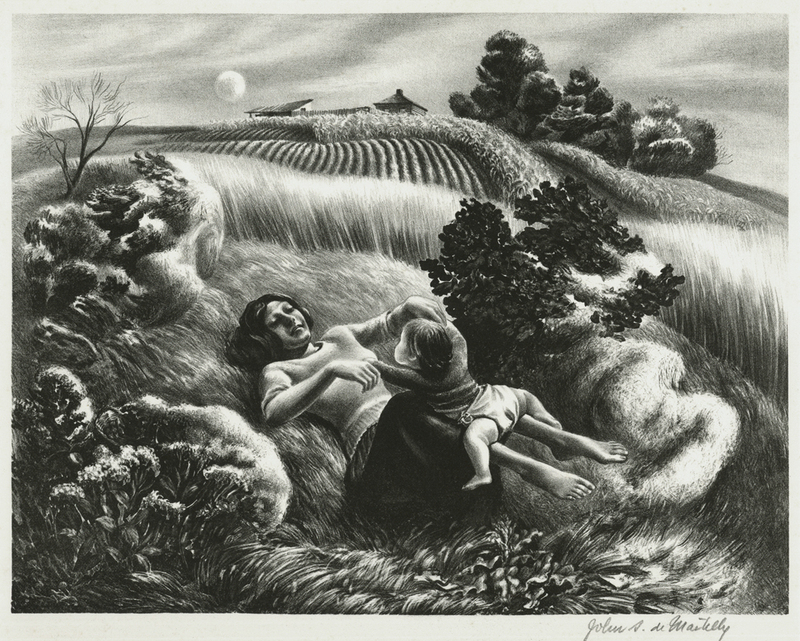 This etching is titled "Marshes at Evening" in the Ordeman catalog, although it is titled in the artist's hand on the lower margin as "Evening in the Marshes". In his catalog of Benson's prints, Ordeman quotes John Taylor Arms, who said of Benson, "[He] has achieved the distinction of founding a school- that of the modern sporting artist. In this, his followers and imitators have been many; his equals none." In this image, a flock of ducks come into the marsh to roost, silhouetted against the still bright sky of a midsummer evening. 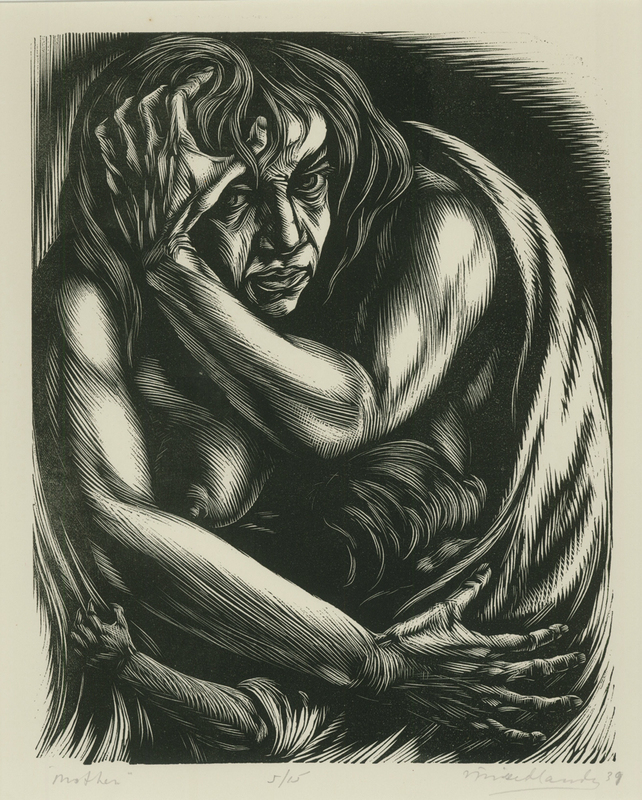 A very rare original woodblock print by Latvian- American artist Isac Friedlander The title of this work is "Mother", it was created and printed in 1939, editioned as 5/15. The woodblock print is hand signed, titled and editioned in pencil by the artist. The image measures 10 1/8X8 inches on a 15 1/2X12 1/2 inch wove type medium weight paper. Isac Friedlander (1890-1968) was born in Latvia. In 1912 he went to Italy where he met and worked with Russian artist Maxim Gorky. During this period he also received his only art training, studying etching, drawing and relief printing at the Academy of Rome. In 1937, he emigrated to New York where he worked full time as an artist until his death. He is best known for his woodcuts and etchings, and many museums have works by the artist, including the Smithsonian, Bibliotheque Nationale, and the Brooklyn Museum. Etching measure 8 x 6 inches, printed on Whatman & Hodamura laid-type paper. ed. 150. Catalog Ordeman 210. Pencil signed. 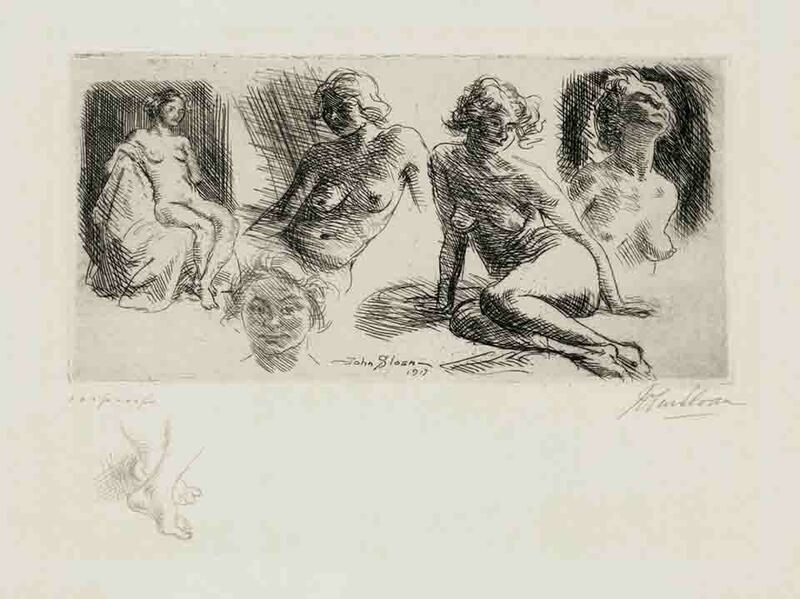 Etching by Jacques Reich after the painting by Giovanni Boldini, image size 20 5/8 x 11 1/2 inches, 1916, pencil signed. Whistler's signature is etched below the image, Boldini's in the lower left corner of the image. C. 1941. Etching and sandpaper ground. Edition of 100. The scene depicted was in the Berkshire Hills in western Massachusetts. Catalog: Giardina 203. Plate measures 10 1/2 x 14 5/8 inches on 13 7/8 x 18 1/4 inch wove type paper. Pencil signed "Kerr Eby imp" in the lower right, indicating that the artist printed it himself. This print has a good use of plate tone in the sky. This image shows his impressive use of highlighting and shadow to show the snow fields at night. 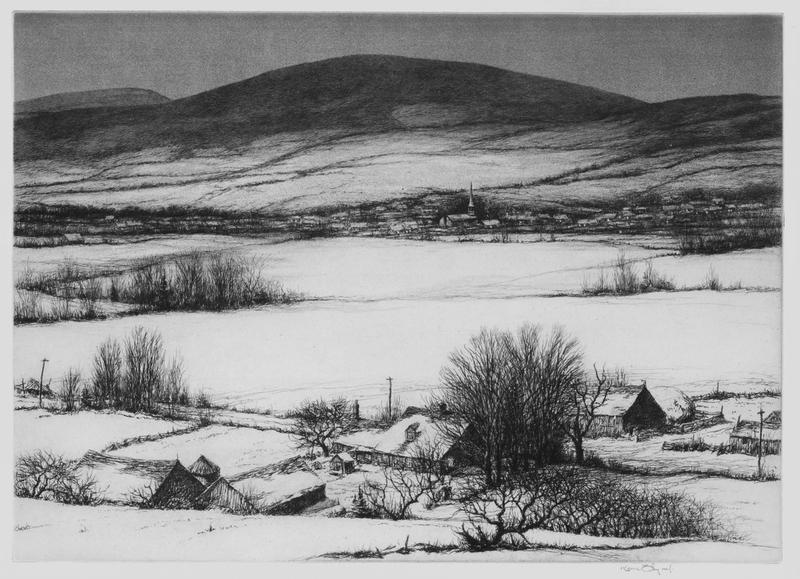 Etching with aquatint, image size 7 7/8 x 10 7/8 inches, 1918-1919, state VII/VIII, cat: Czestochowski-69, alternate title "Far Prospect," pencil signed, framed. 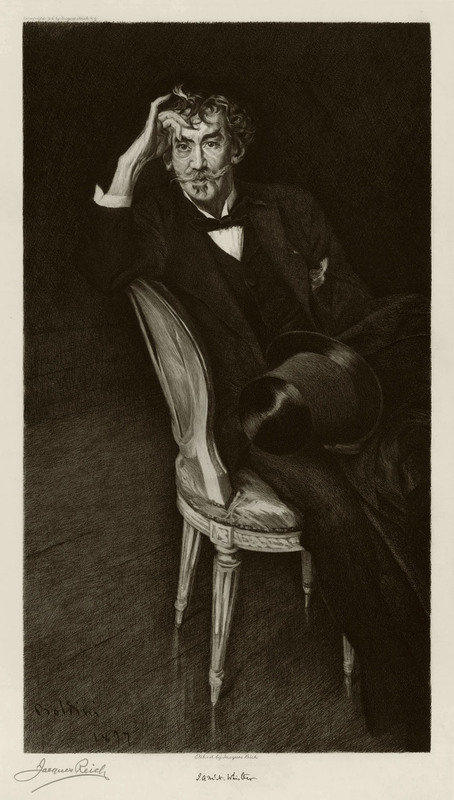 Davies was a truly remarkable artist of the late 19th and early 20th centuries known for his dreamlike etchings and lithographs. In his catalog raisonne of Davies work, Czestochowski writes "In a time of social, political, scientific and artistic upheaval, Davies hewed to an unwavering inner vision, one of classically graceful figures in an eternal dance with nature." This rare, early state etching is a perfect example of the combination of classicism and modernism of Davies' work.